Begins July 1 - Bookmark it! 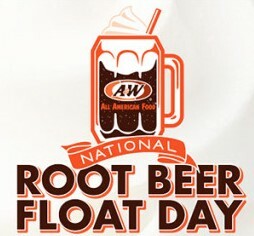 A&W Root Beer will be celebrating National Root Beer Float day by giving you chances to "float a friend" and win A&W gift cards and other great prizes like free Root Beer Floats for a year! Fifty (50) Grand Prizes: “Free Floats for a Year” will be awarded to randomly selected winners at Sponsor’s sole discretion. “Free Floats for a Year” grants winner one hundred and four (104) 20 oz Root Beer Floats to be paid in A&W Gift Checks (two (2) 20 oz Root Beer Floats a week for a year for the winner). Ten (10) Weekly Prizes: The approximate retail value (“ARV”) of the “Float A Friend” Weekly Prizes (based on Sponsor’s average merchandise prices as of December 1, 2015) is: $57.95 (2016 Collector’s Mug, ARV: $14.99; 2005 Collector’s Mug, ARV $14.99; A&W Gift Checks, ARV: $20.00; Rooty Plush Toy, ARV: $5.99; A&W Lip Balm, ARV: $0.99; A&W Sunglasses, ARV: $0.99). The approximate retail value of the “Float A Friend” Grand Prizes is $320 (A&W Gift Checks, ARV: $320).